Denmark and the Netherlands are the only two countries with pension systems that could be regarded as “first class”, according to a comprehensive global pensions study. 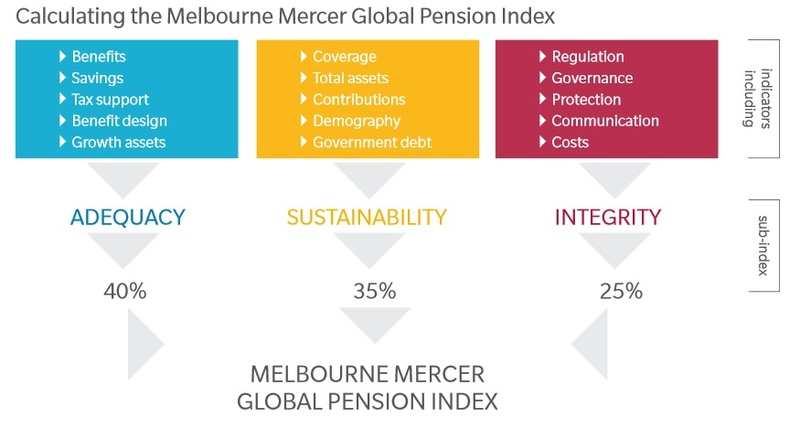 The two countries rank first and second in the Melbourne Mercer Global Pension Index, which measures the health of the pension systems in 25 countries to assess whether they will be able to deliver adequate future provision. The report, produced jointly by Mercer, the consultancy, and the Australian Centre for Financial Studies in Melbourne, says that big reforms are required to improve the pension systems of some of the world’s most populous countries, including China, India, Indonesia and Japan. Japan, Austria and Italy score poorly in the report. They have high levels of government debt, inadequate pension assets and ageing populations, finds the study. Pension systems in other advanced economies including the US, Germany, France and Ireland were also found to face large risks that could endanger their long-term health. The UK’s score was marked down following the recent removal of the requirement for retirees to buy an annuity that would provide a guaranteed income until death. Even Australia’s highly regarded pension system, ranked third in the report, could be improved by requiring part of any retirement benefit to be taken as an income stream, rather than a single lump sum, the report finds. The report shows average years in retirement have risen from 16.6 in 2009 to 18.4 in 2015. Mercer forecasts this will increase to 19.2 by 2035. Only Australia, Germany, Japan, Singapore and the UK have raised their state pension age to counteract increases in life expectancy. “Living to 90 and beyond will become commonplace. More countries should automatically link changes in life expectancy to the state pension age,” says Mr Knox. The Netherlands has already taken this step. Mercer also recommends that governments make greater efforts to ensure older workers remain active. Participation rates among workers aged 55 to 64 differ considerably, from 77 per cent in Sweden to just 40 per cent in Poland. The pace of improvement in activity rates for older workers has also varied significantly over the past five years. He points out that pensioners aged 80 and above represent the fastest-growing cohort globally and annual healthcare costs for this group are around four times higher than the rest of the population. The weightings used are 40 percent for the adequacy sub-index, 35 percent for the sustainability sub-index and 25 percent for the integrity sub-index. The different weightings are used to reflect the primary importance of the adequacy sub-index which represents the benefits that are currently being provided together with some important benefit design features. The sustainability sub-index has a focus on the future and measures various indicators which will influence the likelihood that the current system will be able to provide these benefits into the future. The integrity sub-index considers several items that influence the overall governance and operations of the system which affects the level of confidence that the citizens of each country have in their system. This study of retirement income systems in 25 countries has confirmed that there is great diversity between the systems around the world with scores ranging from 40.3 for India to 81.7 for Denmark. Indeed, there is great diversity between countries but it doesn't surprise me that Denmark and the Netherlands lead the world when it comes to their national pension system. Both ATP and APG went back to basics following the 2008 financial crisis. ATP runs their national pension like a top hedge fund and is actually doing much better than most top hedge funds. The Netherlands has an unbelievable pension system which is why I've long argued the world needs to go Dutch on pensions. What do the Netherlands and Denmark have in common? They have strict laws governing the pension deficits of their public and private pensions and if things go awfully wrong, these pensions are mandated by law to take action to return to solvency. This and the fact that they have long ago introduced a shared risk pension model is why these two countries have the world's best pension systems. It is worth noting, however, that while Denmark and the Netherlands have the best pension systems, the world's best pension plans and pension funds are here in Canada where you will find your fair share of pension fund heroes who get compensated extremely well for delivering outstanding results (some say outrageously well but they are delivering the long term results). The report raises the issue of longevity risk, a theme I've covered in detail on this blog. While I don't think longevity risk will doom pensions, I do think that common sense dictates if people live longer, the retirement age should be adjusted accordingly to make sure these pensions are sustainable. This is why I don't agree with the Liberals and NDP proposal to scale back the retirement age in Canada to 65 from 67, but do agree with them that we need to finally introduce real change to Canada's retirement system and enhance the CPP for all Canadians. As far as the United States, there are new solutions being discussed to tackle a looming retirement crisis but I'm not impressed as these proposals only benefit large alternative investment shops charging huge fees and Wall Street which makes a killing in fees serving these large funds. Moreover, there shouldn't be four views on DB vs DC plans, there should only be one view which clearly explains the brutal truth on DC plans and why well-governed DB plans are far superior in terms of performance and offer big benefits to the overall economy too. What about Australia and its superannuation schemes which are government mandated DC plans? That country came in third in the global ranking, ahead of Canada. As I've stated in the past, while Australia does a great job covering all its citizens, we don't need pension lessons from Down Under. I would recommend an enhanced CPP over any Australian superannuation scheme any day. The heads of the four largest pension funds in Sweden have written an open letter to the government condemning proposed changes to the country’s public pension system. The letter is an embarrassment for the Swedish finance ministry, which said in June it would close one of the country’s five state pension funds and shut down the SKr23.6bn ($2.7bn) private equity-focused fund, known as AP6, to cut costs. The funds, which were set up to meet potential shortfalls within the state pension system, have long been criticised for producing lacklustre returns and for their expensive management structure. But the chief executives and chairmen of four of the funds have called the changes “short term” and “politically motivated” and said the overhaul would have a negative impact on investment performance, which would ultimately harm pensioners. It is the strongest rebuttal yet of the government’s proposals for reform and the first time there has been a public, co-ordinated response from AP1, AP2, AP3, and AP4, which manage $142bn of pension assets. The group attacked the proposals for lacking a proper assessment of costs. The heads of the four funds wrote in the letter: “During the reorganisation, planned to start in 2016 and continue for almost two years, there is a risk that the AP funds will lose their focus on long-term asset management, which will have a negative effect on results. The AP funds were originally split into several smaller groups due to fears that one large scheme would become too dominant an investor in Sweden and too much of a political temptation. The four funds fear the government’s plan to also create a national pension fund board to determine return targets and the investment strategy of the remaining funds would revive the threat of political interference. I'm not sure what exactly is going on in Sweden but if they choose to amalgamate these public pension funds into one national pension fund, they better get the governance right (ie., adopt CPPIB's governance which is based on Ontario Teachers' governance and what most of Canada's top ten use). In my ideal world, we wouldn't have company pension plans. That's right, no more Bell, Bombardier, CN or other company defined-benefit plans which are disappearing fast as companies look to offload retirement risk. The CPP would cover all Canadians regardless of where they work, we would enhance it and bolster its governance. The pension contributions can be managed by the CPPIB or we can follow the Swedish model and create several large "CPPIBs". We would save huge on administrative costs and make sure everyone has a safe, secure pension they can count on for life. I am paying close attention to developments out of Sweden to gauge why the Swedish finance ministry is proposing to reform the pension system and to amalgamate these funds (contact me at LKolivakis@gmail.com if you have any information on this). 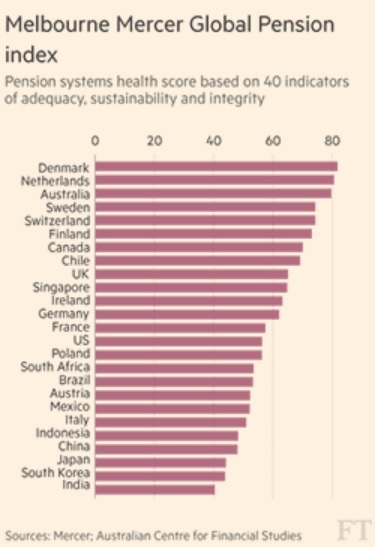 At the bottom of the global pension ranking, I noticed India and South Korea. Don't know much about India's pension system but South Korea’s National Pension Service (NPS), which oversees US$430 billion (RM1.84 trillion) in assets, is understaffed and struggling to generate higher returns. Lastly, take the time to read the latest Absolute Return Letter, The Real Burden of Low Interest Rates. Niels Jensen explains why low rates are making it more difficult for all pensions to generate the returns they need, placing pressure on many of them which are already chronically underfunded. Some countries have begun to take action. Sweden, Denmark and the Netherlands have all permitted the local pension industry to use a fixed discount factor of 4.2%, and in the U.S. the regulator now allows the industry to use the average rate over the last 25 years when discounting future liabilities back to a present value. in terms of addressing the core of the problem – low expected returns on financial assets in general and low interest rates in particular. He's right, pensions better prepare for an era of low returns and if my forecast of a protracted period of global deflation materializes, it will decimate pensions and all the massaging and tinkering of discount rates won't make an iota of a difference. In fact, at that point, even central banks won't save the world. Below, CCTV reports thousands of people rallied in Athens over the tax hikes and pension cutbacks included in the cash-for-reforms deal. The Greek pension system is in such dire straights that nobody is bothering to cover it. Still, if you ask me, Greece remains the very best place to retire in the world as long as you don't rely on the Greek government for your pension. The Quiet Screwing of America? Which Bond Bubble Worries Her Most? Four Views on DB vs DC Plans? A Solution to America's Retirement Crisis? A Brutal Year For Top Hedge Funds? Real Change to Canada's Pension Plan? The Subprime Unicorn Boom in Tech? Where Are The Pension Fund Heroes? Another Shakeout in Hedge Funds? Can Central Banks Save The World? SEC Gunning For Private Equity? CalSTRS Pulling a CalPERS on PE Fees? The Fed's Courage To Act? Why Is PSP Suing a Hedge Fund?